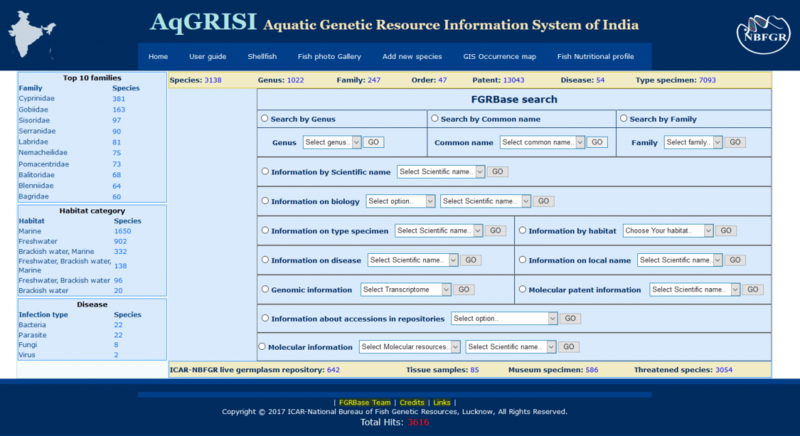 AGRISI, a new information system on aquatic genetic resources of India, has been launched by the National Bureau of Fish Genetic Resources (NBFGR). AGRISI is a unique platform presently covering 3138 native fish species of India. The system provides information on systematics, biology, distribution, nutrition, nutrition, and other characteristics. FBIS, the Fish Barcode Information System. HRGFish, a database of hypoxia responsive genes. FishKaryome, a chromosome database of fishes and other aquatic organisms. FishMicrosat, a fish and shellfish microsatellite database. AGRISI was developed under the Digital India Initiative Programme. It provides country-specific information on fish genetic resources as required by the BDA Act, 2002. It also supports FAO's Report on the State of the World's Aquatic Genetic Resources for Food and Agriculture.